I’m so grateful to welcome a sweet friend to the Simple Deep Life blog today. Jennifer is an amazing lady, wife to a pastor husband, and has two beautiful daughters. I had the privilege of getting to know her last year through one of the Simple Deep Life P.A.C.E. groups and her heart is SO big! Please take a minute and visit her blog as well. God has given her such wisdom and grace! Do you ever get sidetracked when cleaning house? I start in one room and find something that belongs in another room, so I take that item to put it away, and proceed to discover something in that room that needs to be done so I restart the whole project. I also tend to find something that grabs my attention, like baby pictures or old letters, and I get lost in memories and before I know it, hours have passed and I didn’t accomplish what I needed to, or it will take me much more time than necessary. What about other areas of your life? Do you get sidetracked and then just give up? What if we made a plan, set goals, broke them down into smaller, tangible pieces, and worked our way up? Now, consider this in light of your walk with Christ. Do you start a Bible study, miss a day or two, and give up? You might not pick up another study for months, or even worse, don't pick up your Bible for several days, weeks, months or even years? Consistent, smaller goals are very important in our lives. They are the building blocks to help us meet larger, life goals. Becky once said in one of our P.A.C.E groups “The journey to the goal is often times more important than the actual goal”. Here are my 6 steps to setting goals and achieving them. Step 1: Prayer-- Always, always, always start with prayer. When praying we are asking for guidance, direction, and strength. Step 2: Separate your goals into categories, and rank with the level of importance. This step does two things; it puts in check what is most important and it also eliminates idols in our lives. Step 3: Start small and build up. I have had many ladies who have told me, "I make goals but I don't follow through!" My next question is always, "Did you break them down into small tangible goals and build up from there?" I think we often think we can go from novice to distinguished overnight without any effort and that is not the case! What often ends up happening is that we feel like failures because we didn't accomplish what we wanted to. BUT what if we started small? 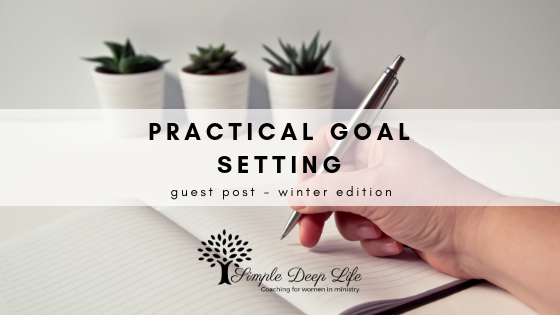 What if we set realistic goals? What if we took a large goal and broke it down into several parts? Break goals down into 30, 60, 90-day goals. Also, it is okay to make revisions to our goals. It is okay to say, “I'm not going to make that 30-day goal, so I am going change that to a 45-day goal”, or stretch it out to where you need it to be. Just don't give up just because you didn't meet that goal in your time, because always remember that everything is in God's time. Step 4: Write every goal out. Write a plan to accomplish it. It is easier to accomplish goals if we know the goal and know the plan. Writing it down also holds us accountable. Accountability in setting goals is not a bad thing. Which leads us to Step 5. Step 5: Have an accountability partner. One that is a friend, a cheerleader, but also one who will help you meet your goals. Plan goals with that friend. ; goals that you can work on together. Step 6: Celebrate victories! No matter how big or small, celebrate! Jennifer Lane is a pastor’s wife, and a mom of two beautiful girls. She is a Liberty University Graduate with a Bachelor’s Degree in Early Childhood. She loves to connect women with God’s Word and one way she does that is through her blog. She loves coffee, probably way too much, and in her free time she loves to read, cook, write, and do anything that involves time with her family.